Pulitzer Prize–winning cartoonist (and fanatical fly fisher) Jack Ohman takes a lighthearted look at one of America's favorite pas- times. 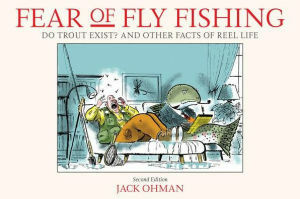 50 cartoons—newly colorized—Ohman sets his hooks into topics ranging from the differences between Western and Eastern anglers and selecting the proper fly to fly fishing history, this re- print of a modern fly fishing classic, continues to entertain anglers bitten by the fly fishing bug. 6x9 inches, Softcover.